Hills Science Diet and Prescription foods is the number one veterinarian recommended food. Hills backs every bag of food with a 100% guarantee. Hills is the only food with a guaranteed analysis to provide your pet with the finest quality of ingredients. 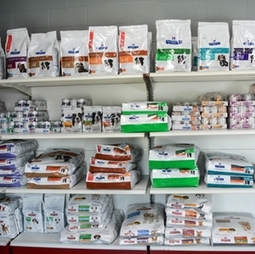 To guarantee the health and happiness of your pet we recommend feeding this high quality food at six weeks of age. There are many different stages of your pets life and with Hills Science Diet in your pets bowl, you will help your pet transition through the years. Prescription diets greatly add to the treatment or maintance of certain problems and diseases. Feeding these foods is important when helping to prolong and maintain the health of your pet. If you have any questions please feel free to contact us any time or visit the website.